Many of you who follow my Facebook page or Instagram, would know that I signed more than 3000 copies in Delhi, at the Thomson Press. It was such an eye opener. The Press is THE largest in India and it is definitely a 'must-see' if you can manage a visit. Have never seen anything like that. Here is what I posted on my Insta gram. EXHAUSTED after signing 3000 copies in a single day. Have been signing for more than 9 hours now. Hands are numb. Shoulders aching. But oh the satisfaction!! You pre-ordered, I signed. From my hands to yours. Coming soon #ItsAllInThePlanets Click on the link in the bio to grab your copy. It was a herculean task to sign so many books and I had shoulder pain for days. Now I have somewhat recovered (and will be travelling to Ahemdabad soon for the book launch! Yes--we kick off the book tour in Ahemdabad) . Meanwhile I thought I would tell you about the characters of my new book. Aniket is a charming young man, a techie who lives in Bangalore. He is slightly overweight. Most people, when they start working become so busy that they neglect their diets, and exercise. Aniket is like that too. He lands himself a HOT girls friend Trish. Trish wants him to lose his beer belly. Aniket will do anything to make her happy. He does love her truly. Watch this video (it is less than a minute) with sound turned on to meet Aniket. Started reading the novel, cannot keep it down..I loved the character of Nidhi, I am also Sagittarian, I am able to relate a lot to her.. Received the book, but due to some personal work, I have not started on it yet. Am sure once I start, I won't be able to put the book down. Thanks for giving us an intro of the characters! Read the novel in one go. I enjoyed it a lot. Thankyou for sending us signed copy Mam. It meant a lot for me. Quite inspring and motivating one as there are things which are destined to happen. Thankyou once again mam. Yet another brilliant work from you ma'am .I have read all your books, but this one tops the list.U and your books have inspired me and its still inspiring.This book deals about how relationships are these days and i found the story so fascinating, that lucidity in your writing.. oh man!just love it.Keep writing books like these and keep inspiring us,and you are an asset for our country. Brilliant,beautiful,talented author you be ma'am. 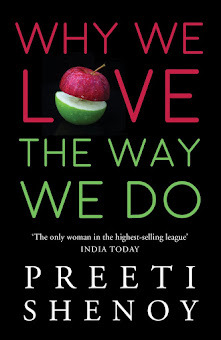 Thanks for this wonderful book.Hope to meet you soon in Chennai ma'am. I have just finished reading the book today and am still overwhelmed by it. 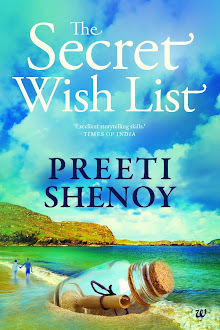 I couldn't put this book down.I love preethi shenoy's ability to connect with her reader, simple language flow just grips you. Her creativity at its best. The Book surely brings love, happiness, sad, emotions, relations and so on. All the characters mainly Aniket, Nidhi, Trish, Manoj and code language speaking Subbu. It also gives an insight about blogs, pottery and care for animals(dogs). I liked in book very much - Sunsign Personality traits in the beginning of the book and Daily forecast giving a gist of what holds in each chapters is unique. The Book is sure shot winner in all aspects. * Life is beautiful when you share it with a supportive spouse;otherwise it can be hell. * This is a part of who he is, and I want to honour that. * Just because someone doesn't match your interests exactly, it doesn't mean you cannot have a great relationship with them. * Relationships. They are such strange things. Just when you think you have a grip on them, something surprises you. You are never in control. And it is always a power shift. Everything you do in a relationship so depends on how much you love that person. * Pg : 120, Article about life-mates and soul-mates. * Love does come with an element of possessiveness, which you have to accept. * Friendship is one of life's greatest gifts, and we get to choose whom we are friends with. A friend is a gift you give yourself. * You live only once. And we all deserve happiness. Most of the time we are so afraid to break out of that rut, the routines, the sameness which we are used to. * A good life partner should encourage you to be the best version of yourself. * Life goes on. Life waits for nobody, Ani. We have to grab it and ride it. * No matter what you do, your destiny unfolds in the way it is meant to. * Maybe there is something beyond our control. Things may not turn out the way we want them to. But how we deal with it is what matters. * Love is too painful. As much as it can relate, it can also kill. And if you do survive it's aftermath, you would still feel the searing pain each time a memory creeps up. * No road is too hard, no path too long and nothing is too much trouble when you are in love. * We are dealt cards. That is fate. But we do have free will. What we do with the blows that land on us is up to us. We can fight and emerge stronger than before. Or we can give up.